Syracuse, NY - The Syracuse Chiefs jumped out to a 4-0 lead and held off a late comeback to beat the Buffalo Bisons, 4-3, at NBT Bank Stadium on Sunday night in front of an electric crowd of more than 6,300. Syracuse (63-76) took the lead in the bottom of the third inning against Buffalo starting pitcher Jacob Waguespack. Taylor Gushue led off with a double to the center-field wall. Victor Robles then singled, putting runners on first and third base. With Matt Reynolds batting, Robles stole second base. Reynolds followed with a walk loading the bases. Jacob Wilson then grounded a ball towards third base where Buffalo third baseman Vladimir Guerrero Jr. bobbled the ball while trying to throw home, allowing Wilson to reach first on a force attempt fielding error and scoring Gushue to give the Chiefs a 1-0 edge. José Marmolejos then grounded into a double play where Wilson was out at second and Marmolejos was out at first, but Robles came home for a 2-0 Syracuse lead. Yadiel Hernandez followed with a single to bring home Reynolds from third and make it a 3-0 ballgame. The Chiefs added a run in the fifth. Reynolds led off with a double. Two batters later, Marmolejos singled up the middle, scoring Reynolds to extend the Chiefs lead to 4-0. Syracuse starting pitcher Austin Voth was perfect through five and two-thirds innings for the Chiefs, but Buffalo got its first baserunner, hit, and run on one swing of the bat. With two outs in the top of the sixth, Roemon Fields launched a ball over the right-field wall for a solo home run, trimming Syracuse's advantage to three, 4-1. Buffalo (61-76) added another run in the seventh. With one out, Guerrero took a ball the opposite way over the right-center-field fence for another Bisons solo homer, pulling the Bisons within two, 4-2. It marked the 19-year-old prospect's sixth home run with Buffalo and 20th of his season overall. Voth exited the game having retired 20 of the 23 batters he faced, including the first 17 batters he pitched against in the game. Voth struck out seven batters in six and two-thirds innings without allowing a walk. The Bisons had the tying run on base in the ninth against Chiefs reliever Austin Adams. Dwight Smith Jr. led off with a double. Anthony Alford was then hit by a pitch to put runners at first and second. Rowdy Tellez struck out swinging, but strike three was a wild pitch that moved Smith to third and Alford to second. Reese McGuire reached on a fielding error by Chiefs first baseman Chris Dominguez that scored Smith to cut Syracuse's lead to one, 4-3. But Adams struck out Jason Leblebijian and got Fields to fly out to left field to end the game. Syracuse and Buffalo close out the 2018 season on Monday afternoon. 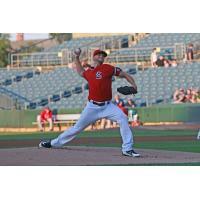 RHP Kyle McGowin will start for the Chiefs while LHP Shawn Morimando will be on the mound for the Bisons. First pitch is scheduled for 1:05 p.m. at NBT Bank Stadium.